Shabbychick Junk. : Things that make you go OOOOOH! Yay for the start of junking season! I love it too! I'm really lucky 'cause my dad's an antique dealer, so even when I can't get out to look, he's always on the hunt for the things I like. Wonderful guy, huh? 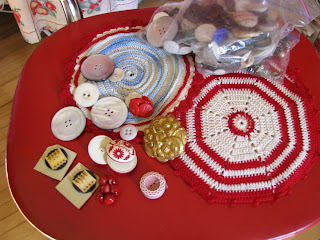 My grandmother had that exact same kitchen stool in red too! Since I was the youngest, that was my designated seat at family meals. Congrats on your great finds (well, except the cockroaches)! You came away with a great haul! Love the stool...we had one too! 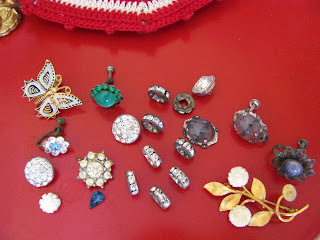 All your finds are wonderful!! I'm so happy your place of employment allows for pets in the cubicle! I really thought you were kidding at first! Honestly, just take that air can after them! Happy Thursday, my friend! You had me snickering for a long time last night! What great finds! You are gonna have so much fun decorating! 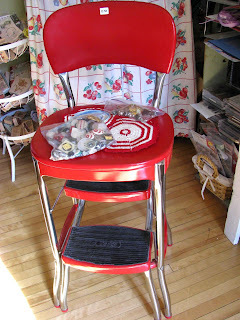 Too funny... when you blogged that your kitchen would be red...I thought of my grannys red stool just like that one , her red and white enamel table, chairs and hutch with the built in flour bin.I learned to cook sitting on that stool.Seeing that pic brings back a lot of memories. Can't wait to see your kitchen! And I hope your critters are gone....ACK! Oh...I am jealous. I wish I would make more time for stuff like that. The stool is a major score, though I love the little pot holders, too. Thanks for sharing! Can't wait to see you in July. Hugs!! Wow! Great finds there, girlie! I need to do some junking myself this season! We used to do a lot of antiquing in the early days of our marriage, and we both miss it. Yuck-O on the cockroaches! What a yucky way to start the day! Hope they got rid of the problem!